We’d love your help. 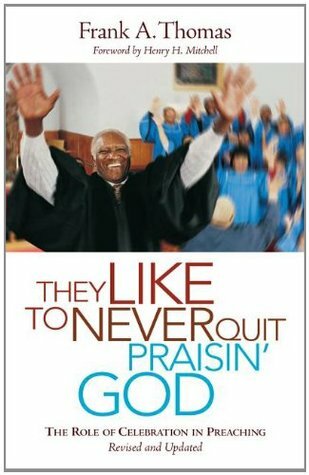 Let us know what’s wrong with this preview of They Like to Never Quit Praisin' God by Frank A. Thomas. To ask other readers questions about They Like to Never Quit Praisin' God, please sign up. Confession: I did not read the whole book, but I have every intention of coming back to it because the half assigned for class was wonderful. Thomas is clearly a seasoned preacher who knows exactly what celebration is, how to do it, and what its purposes are. Certainly I, and others in my own tradition, could learn a lot about celebration from him. Four stars for editing, not Thomas' writing; my edition was so riddled with typos that it distracted from the content. This has been one of the most educational books on how to write sermons I've read so far. I struggled throughout it, not with what the author had to say, but with how one could put it to work in a mainstream predominantly white church, especially during the first four chapters. Chapter 5 forward seemed to clear most of that up for me as the author began to spell out more specifically the process for crafting a celebrative message. By the time I reached the end of the book I was definitely sold. This has been one of the most educational books on how to write sermons I've read so far. I struggled throughout it, not with what the author had to say, but with how one could put it to work in a mainstream predominantly white church, especially during the first four chapters. Chapter 5 forward seemed to clear most of that up for me as the author began to spell out more specifically the process for crafting a celebrative message. By the time I reached the end of the book I was definitely sold. Really good contemporary introduction to the African-American homiletical paradigm of "celebration." Pulls from systems theory to develop a healthy approach to the emotional component of preaching that is stylized in this cultural approach to preaching. Can be somewhat repetitive, however Thomas presents his material with confidence and competence. Frank Thomas provides a detailed look into the philosophy and practice of Celebrative Preaching. For those of us who have been moved by the power of celebration in African-American preaching, this inside look helps us understand what is involved in the preparation of sermons that sing. Personally, I came away with new insight into incorporating more power of emotional movement into my own preaching. His sermon work sheet has potential for any of us who spend our time trying to figure out how to m Frank Thomas provides a detailed look into the philosophy and practice of Celebrative Preaching. For those of us who have been moved by the power of celebration in African-American preaching, this inside look helps us understand what is involved in the preparation of sermons that sing. I purchased this book for a class, and it really was a great read. Fascinating insight into the African American preaching tradition, and also important components of Gospel preaching that every preacher should consider. I really learned a lot from this book on some of the best historical and contemporary features of African-American preaching. Robust with examples and very challenging to those of us overly committed to merely cognitive-appeal only philosophies of preaching. I'm very biased on this review because Dr. Thomas is like a second father, but this book is outstanding. If you want to preach better, get this book! A highly useful homiletic, with a welcome nut-and-bolts character. Especially useful for White preachers considering adding celebration to their toolbox.